This is a necessary work light in your toolbox, it can be a lamp to light in dark and also can be a power bank when your phone is run out of battery in emergency circumstance, and of course great for outdoor camping, hiking, hunting, car repairing and home using. 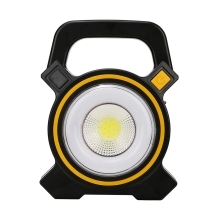 2 lighting modes: High long distance light and low beam, maximum lumens is 300. Can be a lamp to light in dark as well as a power bank when your phone run out of battery in emergency. Easy and convenient charging ways: by USB cable or solar charging. ABS construction durable enough for long time use. A handle for convenient carry or hang on somewhere for hand-free operation. Great for camping, hiking, fishing, repairing, reading and other outdoor activities.